Stacey Clancy was born and raised in Maryland. After studying visual arts at the University of Maryland, Baltimore County, she began working for a specialty veterinary practice—and realized her true calling. Stacey became certified in Canine Massage in 2008. In 2010 she attended the Canine Rehabilitation Institute, where she received her certification as a Canine Rehabilitation Assistant. Stacey enjoys all aspects of canine rehabilitation, with a special interest in hydrotherapy treadmills and other forms of water-assisted exercise. 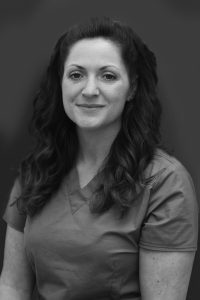 She has worked extensively with a variety of treatment modalities and brings years of clinical experience to the Skylos team. Stacey shows passion and dedication to her patients and to their owners. She acknowledges that no two dogs are the same, and takes the time to treat their individual needs. Stacey genuinely loves working with animals and could not imagine being involved in a different profession. Stacey lives in Frederick, Maryland with her husband and their two dogs, Molson and Tyson. She enjoys live music, picking crabs, outdoor activities, and the company of her family and friends. Should you ever need surgery for your furry family member, we highly highly recommend Skylos Sports Medicine. Friendly, compassionate, and genuine care of our furry family members, but it goes further than that as they are understanding and empathetic for those of us who enjoy our furry children!